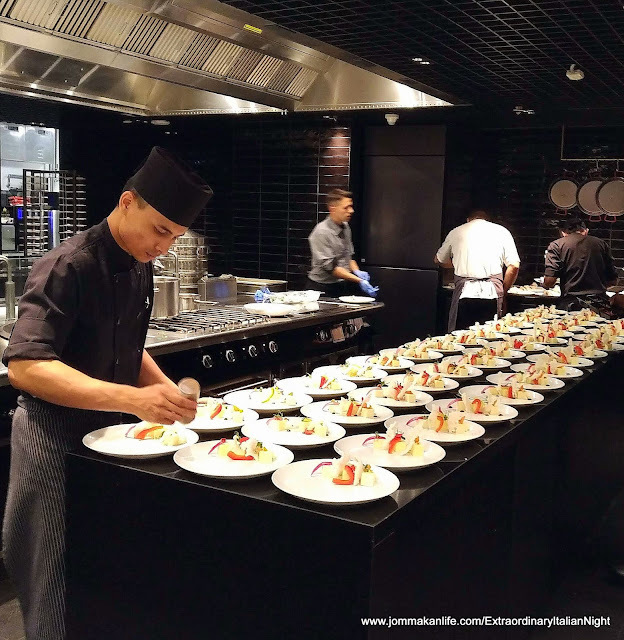 One Michelin starred chef Daniele Repetti (pix above) and his colleague chef Giorgio Gambelli were in Kuala Lumpur from 24 to 29 November, for the 3rd Italian Cuisine Week organised by the Italian Trade Agency – Kuala Lumpur. Launched by the Italian Ministry of Agriculture and the Ministry of Economic Development, The Extraordinary Italian Taste effort was created to promote authentic Made In Italy food products and brands. 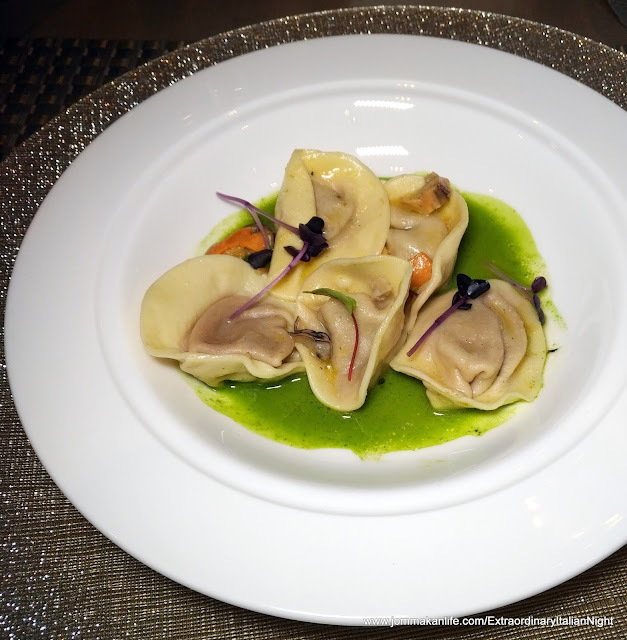 Now into its 3rd year, the Homage to The Italian Tradition of Genuine Cooking opening showcase was held at Curate, Four Seasons Hotel Kuala Lumpur. In collaboration with the Curate team, Chef Daniele transformed raw, locally sourced materials using the values of Italian cuisine and traditions for the night’s wine and food pairing affair. 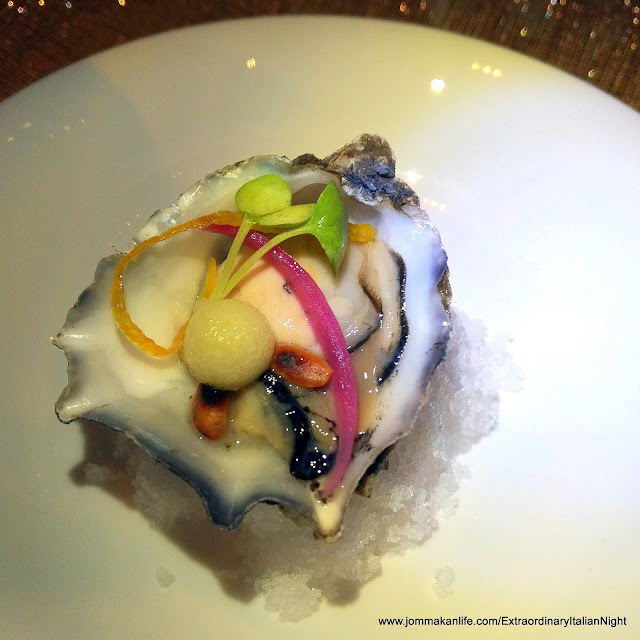 Our palate was tickled from the get-go with a plump oyster au naturel adorned with a honeydew ‘pearl’, pine nut, orange zest and microherbs. It was a delightfully refreshing teaser when savoured with the rich, sweet fortified Luretta Malmsey Malvasia Secca wine. Nutritionist Dr Rolando Bolognino then espoused on the nutrients and goodness of each course throughout the evening, to highlight different good food and fine wine pairings. 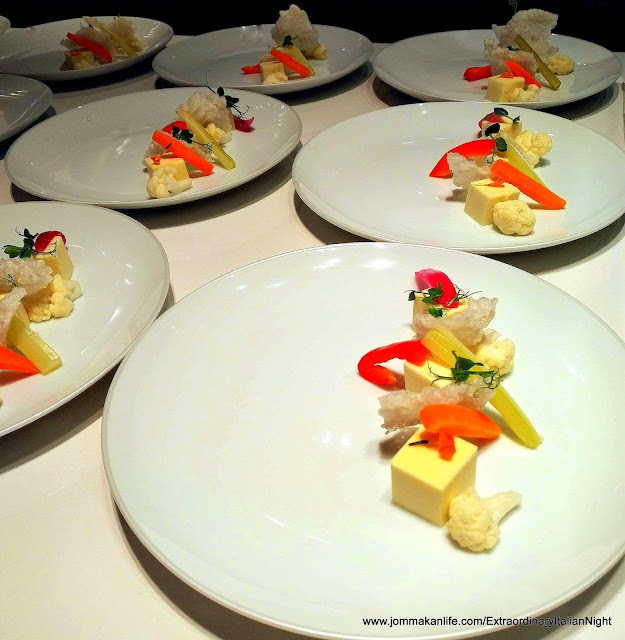 Our starter: creamy Parmesan Cheese Terrine, Pickled Vegetables, Puffed Tapioca Chips and Balsamic Vinegar Gel was excellent when paired with the golden tipple. Hints of fresh herbs and ripe melon accents were discernible in the nectar-like wine. A hearty dish of Tomato-filled Ravioli in Seafood Soup made a splash with us next. Bits of mussels lent depth to the lush savoury soup, making us wish for more. 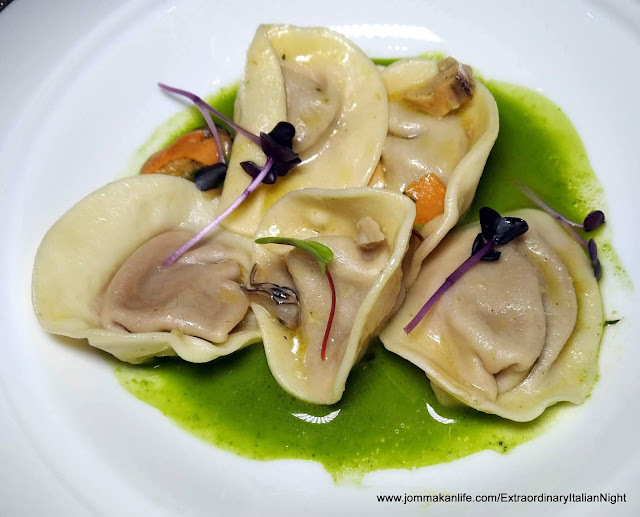 The heartwarming appeal of both the broth and generously filled ravioli was heightened by the zippy, fresh Castel Vento Sauvignon Blanc by Cantine Luretta. 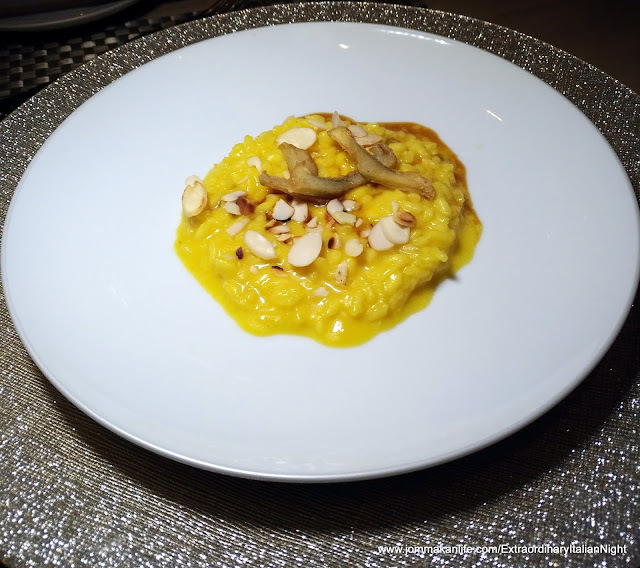 Although the pared-down Saffron Cream Risotto with Beef Broth Sauce, Almonds and Deep-fried Artichokes was a tad underseasoned, the risotto nutty savouriness melded well the noticeably raspberry nuance of the supple Luretta Achab Pinot Noir. Cooked slowly over low heat to break down the muscular veal cheeks, Chef Daniele shared how braising the cut ensured meltingly tender results. His Braised Veal Cheek with Creamy Potato with Rosemary, Poplar Mushrooms and Black Truffle formed a noteworthy partnership with Castel Vento Cabernet Sauvignon by Cantine Luretta, a tannic red redolent with intense blackcurrant and plum overtones. Dinner was brought to a close with Bavarian White Chocolate Mousse with Amaretti Biscuit Crumble with Pineapple Sorbet complemented by the easy-to-drink, straw yellow Luretta Le Rane Malvasia Dolce. We love the flirtatious, ripe fruit notes and smooth suppleness of the white wine — just the necessary high to wrap up a convivial evening.